Kitchen scales can make a world of a difference when you’re working in the kitchen. Although nothing works better than raw talent and skill, a professional tool such as the kitchen scale can really help make your food so much better. Not only can a kitchen scale help you make better food with more accurate measurements, it can also help you in other aspects besides the kitchen, like hobbies or weighing a letter or package before you post it. Use a kitchen scale to help measure out baking ingredients, meats, and liquids. A kitchen scale can also help you when you’re trying to accurately track calories, on a diet, or trying to follow a recipe. A kitchen scale is extremely essential when you're baking. It can help you get that perfect consistency with all your baked goods, which many people will be begging you for your recipe. So, if you'd like to find the best kitchen scale for baking, keep reading. The AccuWeight advanced scales are now engineered to be tempered with a durable glass surface and a newly developed sensor. It’s one of the best digital kitchen workhorse scales and can weigh an extreme amount of ingredients. The brand has realized that an all-purpose food scale is slowly becoming an essential part of a kitchen; thus, the AccuWeight scale has been designed to have all the basic functions you’d need for any kitchen tasks that require accurate measurements. The AccuWeight system comes with 4 loaded G-force sensors that provide advanced accuracy and measurements. It can measure up to a total of 5kg, and you can easily switch between each type of measurement. The units of measurement that are included are: lbs., ounces, fluid ounces, mL, and/or grams. It’s a very multifunctional kitchen scale that provides its uses with a low battery notification and will indicate when there is an overload. When you want, you can choose to use the zero-tare function which will automatically zero out any weight on the scale. It includes an auto shut off function to help preserve energy and extend battery usage. 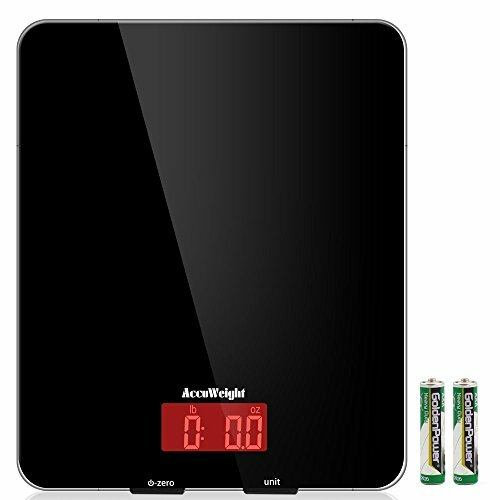 To use the scale, it requires 2 AAA batteries which are included when you purchase the scale. It’s a highly versatile scale which is perfect for children to learn more about weight and measurements. Use this food scale to help you with your fitness goals and other kitchen projects. To help you it also includes a stain-resistant surface which cleans easily just in case you have any accidents while measuring out liquids, solids, or anything else. 1 YEAR WARRANTY! REGISTER your product after purchase and RECEIVE EXTENDED 3 YEARS Warranty - Accuweight accurate scale warrants this product to be free of defects in parts, materials and workmanship for a period of 3 YEARS, from date of purchase. ACCURATE - 4 high precision G-force load sensors provide accurate measurements, measure up to 5kg (11 lbs or 176 oz), easily choose between measurements in pounds/ounces/fl.oz. (fluid ounce)/mL and grams. 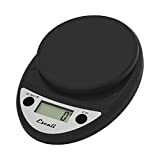 MULTIFUNCTIONAL - Electric kitchen cooking scale provides low battery and overload indication; Zero/Tare Function; Auto Shut-Off Function; 2 AAA batteries (included). 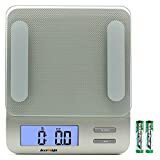 USEFUL VERSATILITY - Accuweight Digital Kitchen Scale perfect for your kids to learn about Weights & Measurements & how to Follow Instructions; Fantastic for helping with Portion Control and Losing Weight. PORTABLE DESIGN - Stain resistant glass platform cleans easily. It's compact, so you can easily store it away when not in use. Perfect for home cooking and food portioning. The My Weigh Kitchen brand has worked to craft their scales to be easy to use with only a few buttons. They’ve realized that over the years that kitchen scales need to be simple, easy to read, and have a few basic functions. They have a very easy-to-read LCD screen that will display all needed information and a large-enough scale to hold and weigh different amounts of food. This kitchen scale uses a percentage function which weighs food. It has a very large weight capacity of 8,000 grams. If you’re not comfortable with weighing your food in grams or need a different type of measurement unit, the units that are included are; lbs., lb./ounces, ounces, and kg. It’s designed with stainless steel to make it extremely easy to clean, meaning less of a mess and easier applications. To help people who have a hard time seeing other display screens, the information is displayed on a bright backlit screen. 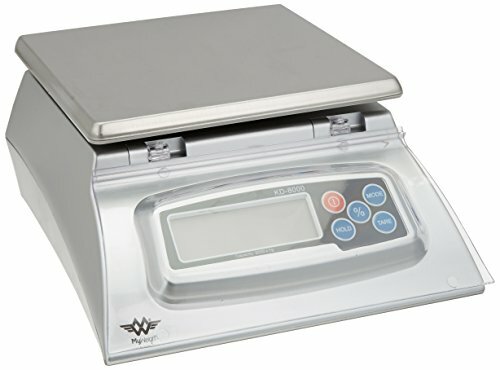 Percentage weighing function; great for baking and soap making. Easy to clean stainless steel platform and hinged gunk shield for messy applications. The Escali digital kitchen scale is designed to measure ingredients with better accuracy and enhanced consistency. The brand has noted that when you’re cooking you need the confidence of knowing that your ingredients are measured to be accurate and consistent. This food scale is designed to have the most accurate measurements which you can trust. It includes an easy-to-read LCD screen, just to make it a little easier for you. The control panel is sealed which helps protect the display and controls from any dirt or food residue. It has a tare feature which can zero out any weight that was placed on the scale. It has a nonslip rubber footing which makes it secure and slips free. Included with the machine are 2 AA batteries, which come with the unit when you purchase it. There is a convenient low battery indicator which will warn you when the battery is running low. It comes with a lifetime guarantee just in case your unit is defective or is not up to standard. The VAVA digital kitchen scale is designed with durable materials that are crafted from tempered glass. The brand has realized that a lightweight and-easy-to move scale is essential in the kitchen. This unit was designed to be extremely thin and less bulky than other models on the market, which can help save space when storing it. The VAVA brand has designed many other scales, so they know what they are doing. This kitchen scale is crafted from tempered glass to make it ultra-sensitive but still accurate when measuring weights. It has a touch-control button which makes it easy to use and keep clean even though the toughest of messes. There are 4 high precision sensors which provide extreme accuracy. The units of scale that are included are grams, lb./ounces, mL, fluid ounces. These are all displayed on an LCD display that clearly shows the information in big numerals. This unit is FDA certified for weighing all types of foods, solids, or liquids. The unit has a tare function, auto shutoff, and overload with low battery sensors which are displayed on the screen. There are 2 different moves to measure, one which accurately weighs the ingredients and the other which is for food weight and liquids. 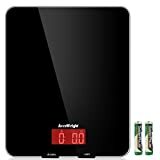 The AccuWeight Digital Kitchen Scale is designed to have a high degree of accuracy. The brand has realized that sometimes kitchen scales need to have a very easy-to-read display and a quick cleaning surface. To help these customers, the brand has designed the AccuWeight Digital Kitchen Scale to have a sleek design and be easy to use. This brand has been in the business of creating exceptional kitchen scales over the years, and two of them made it onto our top list; this is surely a sign that they are doing something right. This food scale is an electric scale which is programmed to give you very accurate and high precision weight measurements. The units of weight that are included are lbs., ounces, grams, milliliters, and fluid ounces. The scale is crafted from tempered glass, making it durable and easy to clean. It includes a user-friendly tare function which can zero out measurements. The display features a large 3.2-inch backlit display which allows users to comfortably read without squinting. The scale can measure up to 5,000g/11 lb. items and cooking materials. 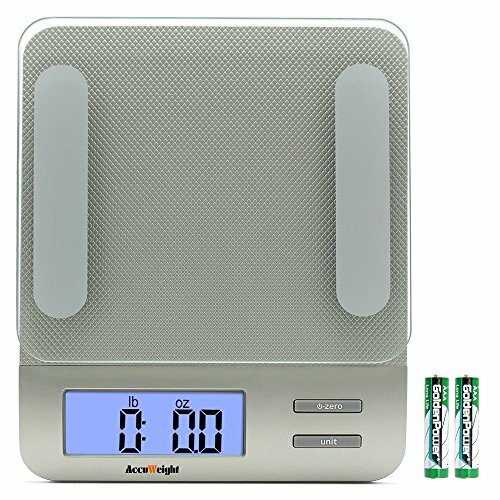 To be even more user friendly, the scale will display when the batteries are running low or when it is starting to get overloaded. This scale has a very elegant sleek design and is easily storable and portable. Electronic gram scale equipped with 4 high precision sensors to give you accurate weight all the time;Max weight capacity up to 5000g / 11lbs / 5000mL / 176 fl. Oz. Accurate to within 1 g/0.1 oz. Our digital meat scale tempered glass platform, is not only safe and hygienic but also easy to clean and store. 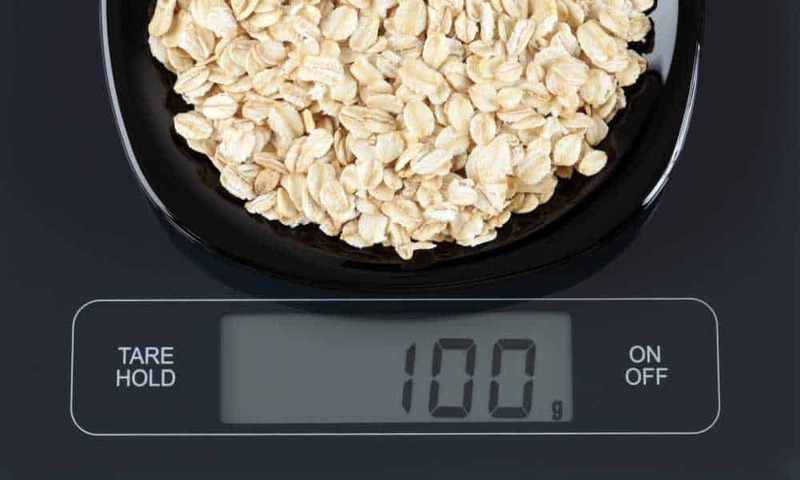 User-Friendly: Zero/Tare function of the food scale allows you to zero out containers when weighing multiple ingredients, quick unit conversion. Units of Measurements Available: pounds, ounces, grams, milliliters, fluid ounces. Digital scale built with 3.2" Large blue backlight LCD display, makes for much easier readability. 1 YEAR WARRANTY! REGISTER your product after purchase and RECEIVE EXTENDED 3 YEARS Warranty on AccuWeight cooking scale and we always stand behind our products. As you can see, there are so many uses where a kitchen scale can come in handy. Use it for baking, cooking, dieting, meal prep, and so much more. Choose to measure between liquids and dry ingredients, along with meats and other foods. Kitchen scales also have uses outside the kitchen such as hobbies and crafts, or to weigh letters or packages before mailing. Use it to weigh almost anything below the maximum weight capacity. 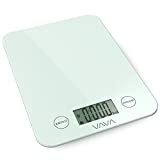 If we had to choose the best kitchen scale to recommend, we would have to choose the VAVA Digital Kitchen Scale. It has an elegant design, has many useful features, and comes at a reasonable price. Hopefully, this article has helped you choose the best kitchen scale for cooking. If you’re not completely sold on one of these scales there are many more on the market which offer different settings and features. Hopefully you find what you're looking for and happy shopping!